Better battery than previous model thanks to H1 chip. If you're looking to just listen to music or a few podcasts, the new Airpods are a good choice since the connection never drops and the battery life is longer than the previous version. Plus you can also charge the case wirelessly with any Qi wireless charger. Just don't expect to get a great sound experience and be prepared to lose at least one. Apple’s Airpods have been out for a while now, but their combination of features and performance make them one of the best truly wireless earbuds out there. While they may not actually fit in your ears, for the lucky ones that can use Apple’s audio products, they’re a real treat. If you’ve gone outside at all in the past two years you’ve likely seen more than a few people wearing AirPods. Somehow, they’ve become one of the most popular pairs of earbuds in the world and it’s hard to go two city blocks without seeing them, despite them making the user look absolutely ridiculous (sorry Airpod lovers, it’s true). But as popular as they are, they were never perfect. They recently got a hardware refresh, and while Apple completely ignored most of our wishes for what would make them a truly great product, they are slightly improved. But how so? Editor’s note: this article was updated on April 15, 2019, to include objective microphone data. Besides the H1 chip inside, there is basically no difference between this and the previous Airpods. The box is pretty standard for the Cupertino company: all white, with a picture of the Apple AirPods on the front. Inside the box is the charging case with the headphones, some instruction and warranty booklets, and a lightning charging cable. How are the Apple AirPods built? 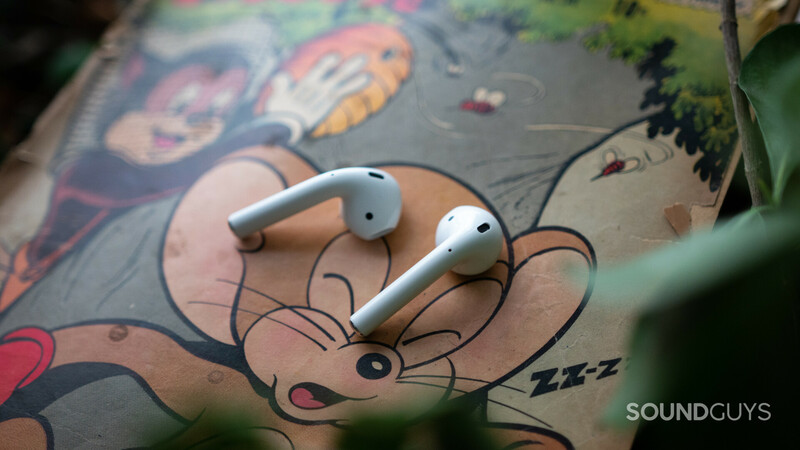 Apple is king when it comes to build quality and design, and that’s still the case with the AirPods… kind of. Even though they’re made of plastic, the charging case feels great in the hand. It’s lightweight and sturdy enough to be tossed into your pocket. This is good because you’re going to want to keep the case on you at all times—even if it’s just to store the ‘buds when you’re not using them. The new Airpods (or Airpods 2) still look exactly the same and have exactly the same build as well. So if you, like me, had trouble getting the originals to fit your ears then you’re out of luck. These are going to be just as impossible to use thanks to Apple believing that these are one-size-fits-all, which they are not. Contrary to the all-plastic construction, the Airpods are durable. The bottom of the case has a single Lightning port for charging, and on the back there’s a button to enter Bluetooth pairing mode. But what really makes the build quality stand out are the magnets. The lid is held closed by a magnet, and flicking it open or closed is easy. There are also magnets on the inside of the case, so even if the lid does open, these won’t fall out. What’s probably the only difference visible to the eye when it comes to the original Airpods and the new Airpods is the small LED light for charging and pairing. It used to be on the inside of the case, so you would have to flick open the case in order see it. Thankfully, it’s been moved to where it should have been all along: right on the front of the outside. 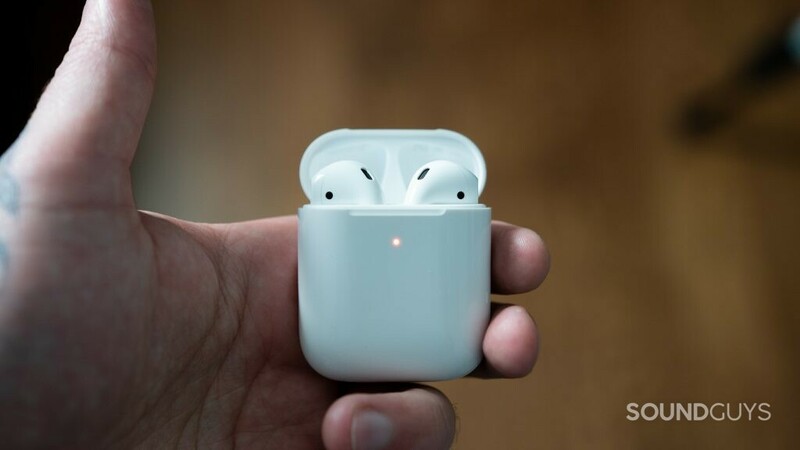 Plus, the 2019 version of the AirPods is the first option to have a wireless charging case, compatible with certain Qi wireless charging pads. Though, if you want that option be prepared to shell out another $50. While we’re on the topic of bad news if you were waiting for the rumored Airpower that Apple announced a while back to wirelessly charge your devices you’re out of luck. 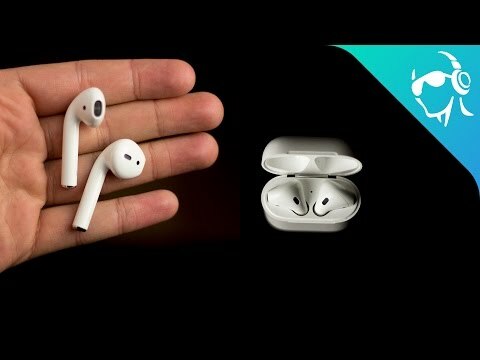 Even though Airpower was rumored still to be coming even as these new Airpods were released, the company recently cancelled it altogether. Then you get the Apple AirPods themselves, which haven’t changed much. Actually, they haven’t changed at all. The old ones will even fit in the new case if you want to only pick up the wireless charging case. But the lack of a new design isn’t exactly a good thing either. The AirPods’ inability to seal your ears leads to a lot of problems that just aren’t all that easy to hand-wave away. For example, outside noise is a much bigger problem for users of AirPods than it is for users of Bluetooth in-ears because neither version of Airpods isolates at all. Additionally, because they don’t seal, some people will find that the AirPods sitting outside the ear canal makes them vulnerable to drop-outs and shifting positions. These are extreme problems for true wireless earphones, as losing one ‘bud means the death of your product. Now I’m sure you’ve seen plenty of people do all kinds of physical activities wearing Airpods, and if you’re one of them consider yourself lucky because if the Airpods don’t fit in your ears, they really don’t fit. I can barely walk casually without one or both of them falling onto the pavement, and that hasn’t changed here. Both ‘buds snap into the case magnetically just like before, and you can even buy the case separately. The case is absolutely necessary when using the Apple AirPods. If you don’t have it with you, it’s all too easy to misplace and lose the earbuds. We did a fit test video on how the original version fit, and since the build and design hasn’t changed at all it’s still applicable here so make sure to go check that out if that’s what your main concern is. 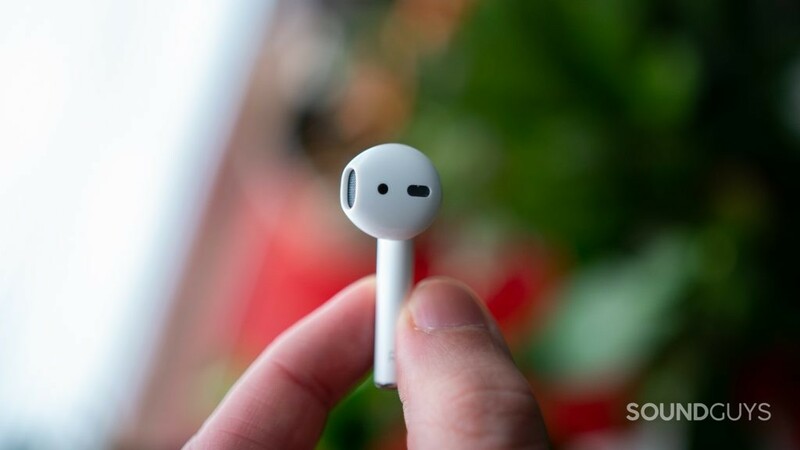 As for the overall AirPod design, they don’t look too different from regular earpods, just without the wires obviously. On each earbud, you have a tiny microphone for voice calls and a small sensor that gives you a few controls when you tap them, which brings us nicely into the next section here. The AirPods do a decent job at accurately relaying the human voice and outperform the Samsung Galaxy Buds. We’re splitting this part up into two sections: iOS and Android. The Airpods work on both Android and iOS, but don’t expect them to work perfectly. Connecting to an iOS device is as simple as tapping connect on the card that pops up on your device. When you connect to one device it also connects to every device on your iCloud account. During testing music never skipped once while connected to my iPad Air (except for when I was really testing range but that doesn’t count). You also get full access to all of the cool sensors and features on iOS. For instance, when listening to music you can take one earbud out to pause the music, and placing it back in your ear will resume music. Plus, the new Airpods come with a new H1 chip (updated over the previous W1 chip) which lets you use the “Hey Siri” phrase to activate the voice assistant hands-free. Of course, you can also turn this option off in the settings of your iOS device if you want to squeeze a little more juice out of these batteries. You’re going to have to get used to talking to Siri because that’s also the only way to control volume which kind of makes no sense, especially if you’re on the subway. In the settings on iOS you can change the double tap to pause or play music, which also makes no sense. If I’m reaching up to double tap, I might as well just remove the earbud to automatically pause the music. When it comes to range I was able to get to leave them on my desk and walk around my entire house easily without any stuttering. That’s about 60 feet away with walls and a floor in the way, not bad at all. Overall, I’d say the connection was pretty great with iOS. 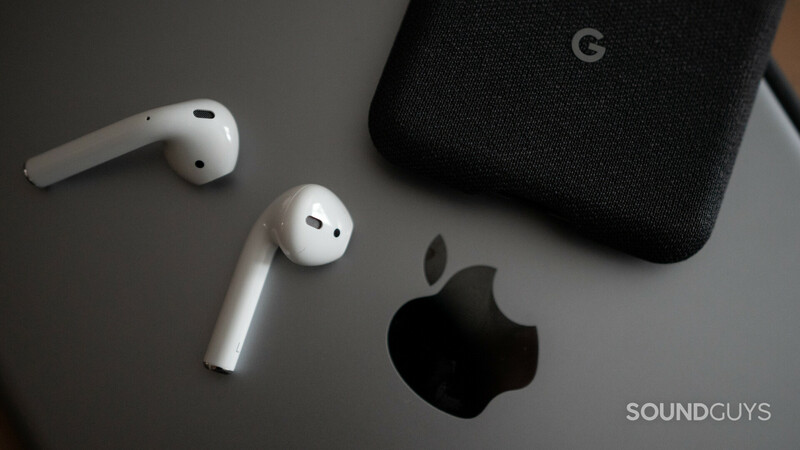 When the Apple AirPods were initially released, they weren’t compatible with Google Assistant; however, as of July 2017, that has changed. This was more of a process and a much different story. The connection was still impressive, just not great. 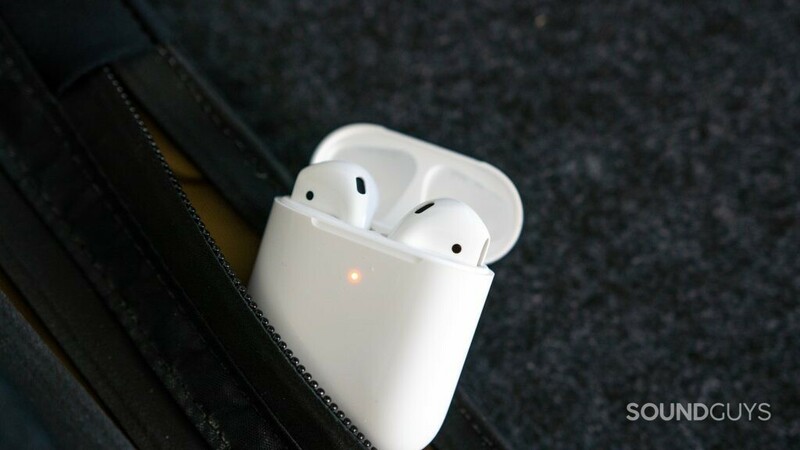 To connect you have to pop open the case, hold down the button on the back of the charging case to enter pairing mode, and also find the AirPods in your Bluetooth settings. Okay sure, that isn’t really a big deal. But once connected, the experience is different. The connection strength to my Google Pixel wasn’t nearly as good as on my old iPad. I counted about nine stutters in only two hours of listening. The range also suffered when on Android. I was able to get to to the fringes of 50 feet before stuttering occurred if I turned the wrong way. With the new Airpods, I even experienced a significant lag in audio between the left and right ‘buds, which only resolved itself after I paused and played the music. This is to be expected considering the new H1 chip is optimized to work with iOS, but it’s something that’s worth mentioning if you want to use these with your Android device. You also won’t be able to automatically pause music by removing an earbud. Music just continues playing. Double tapping the side of the AirPod does access the Google Assistant, which will allow you some control, but not as much as say, the Sony WH-1000X M3. Though I was still impressed with the range and the synchronized music playback, it’s easy to say that they won’t play as well on Android as they do on iOS. Android phones add in audible noise at the same frequencies that make up human voices. 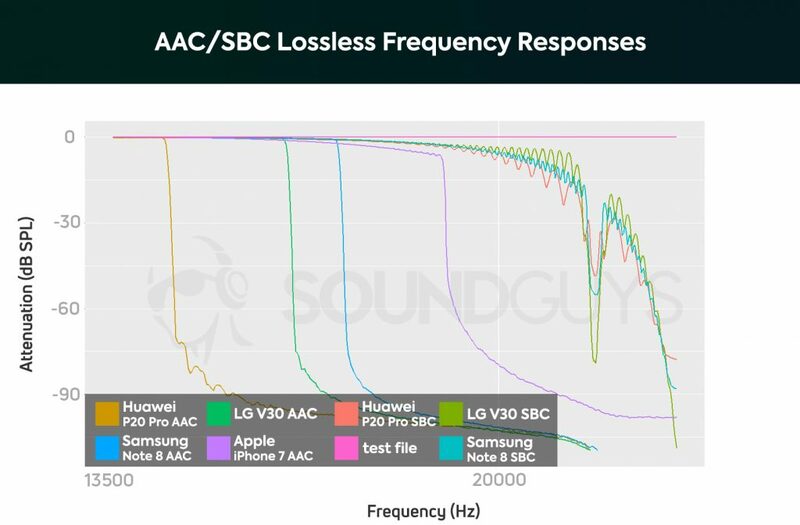 Additionally, testing by our crack team here at SoundGuys revealed that connecting to Android devices means lower audio quality, though just how bad it sounds varies from device to device. It’s peculiar—and frustrating—but it’s another reason why we don’t list these as the best true wireless earbuds out there. A set of headphones or earphones that use only AAC will introduce an element of variability to your listening, and that’s no fun for anyone. Apple claims that the battery will last you about five hours on a single charge, but during our objective testing, we weren’t quite able to reach that. Instead, at 75dB we found that the new Apple AirPods were able to provide 4.125 hours of playback time using an iPhone X over the AAC codec. Compared to the original version, the H1 chip seems to offer about 21% longer life on the newest iteration of Apple’s true wireless earbuds. Though this may seem like a significant increase, we’re only talking about 30 or so minutes of extra battery life because the power cell is so small. The new charging case has the same dimensions as the old one, save for a small LED light on the outside. The overall battery life is quite poor compared to even regular Bluetooth earbuds, or even Bluetooth over-ears. And that’s if you’re using them with an iOS that has been optimized to work with the new H1 chip. If you’re connecting to an Android life, battery life is basically unchanged from the first version at only 3 hours and 29 minutes. That H1 chip also helps switch between iOS easier (which works nicely between my iPhone X and iPad Air) and it also allows for a stronger connection when you’re on voice calls. To be fair though, the quality of your call is going to depend more on the service coverage you have, but the Airpods will still get the job done. The earbuds itself work just like before, and are virtually identical. As we already mentioned, the AirPods take a one-size-most-all approach, so chances are these won’t fit your ears perfectly. This means that outside noises easily find their way into your ears and these things leak like it’s nobody’s business. If you don’t want the person next to you to hear your music, you’re going to have to turn down the volume substantially. Apple does a good job at targeting a consumer response, but no isolation means that bass will end up getting drowned out by literally anything going on around you. The theme here is that the AirPods have a very consumer-friendly sound, and you can see it above. However, this is only under perfect conditions. The AirPods target a somewhat bass-heavy response, but most people will not hear it simply because the AirPods don’t cancel out sound, nor do they block it out. The bass (pink) and the mids (green) are where most vocals and music live, and this type of response is very common in consumer headphones. 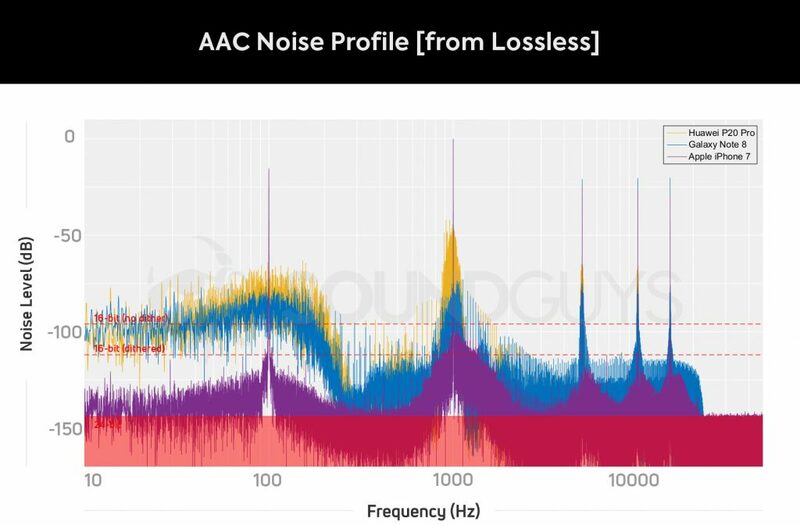 There’s a peak in the highs (cyan), but again, it’s a super common feature in headphones of all types meant to mimic how the human ear hears high-frequency sound. Right to the point, the low end isn’t great, but that’s entirely because of the lack of a seal. For example, the bass in California by Childish Gambino feels like it’s a very low mid rather than a bass. Just like the regular wired EarPods, the mids are given a huge boost in these; vocals come through crystal clear. This goes for voice calls as well, by the way. These are probably the clearest phone calls I’ve ever taken on Bluetooth ‘buds. When it comes to music you can easily sing along to your favorite tunes, but background elements don’t really sit well with each other. Basically, every instrument in Generator ^ Second Floor by Freelance Whales seems to lose its weight and depth. Considering how loud these can get, I’m actually really impressed with the highs. Sure, there isn’t a ton of detail reproduced by a cymbal hit, but nothing ever gets harsh or painful. The Apple Airpods are easy to connect, if they’re connecting to an iOS device. Android-users will have a more fraught time. Should you buy the Apple AirPods? Let’s be honest, you’re probably not buying AirPods for sound quality. If you are, you’re better off finding something on our list of alternatives to scratch that itch. The only difference I can find between them is that the AirPods have killer features, and they’re wireless. The reasons to buy the AirPods have nothing to do with sound and everything to do with convenience, but that only works if you have an iPhone. The charging case is amazingly built and easy to carry; removing one ‘bud to pause or play music works perfectly, and the connection rarely drops. Plus, the new version gives the Airpods even more battery life and you can charge the case wirelessly which is nice. That said, they’re clearly made for iOS users and they still don’t offer much in terms of extra functionality—Android users have absolutely no reason to buy these. The Jabra Elite Sport Wireless or Bragi Dash also offer things like heart rate monitoring, workout tips, sweat or waterproofing, and a nicer design in my opinion. But they’re also significantly pricier. If you don’t care about any of those features and just want to listen to music, the new AirPods with the updated wireless charging case aren’t terribly priced at $199.